This is a set of 12 mounting nuts for 1970 - 1981 Camaro and Trans Am 3 pc Rear Spoiler Mounting Kit. 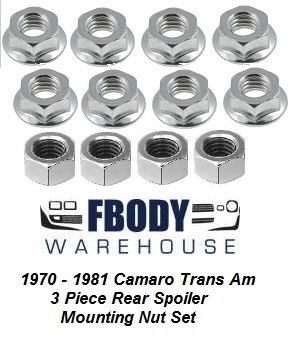 This is a replacement set of 12 mounting nuts for 1970 - 1981 Camaro and Trans Am 3 pc Rear Spoiler Mounting Kit. Why bring your car home from paint only to install rusty screws, nuts, and bolts! We offer well over hundreds of different clip & fastener install kits! 8 washer-less nuts for both end pieces and ends of center piece. 4 washer nuts for securing the center of the center piece.